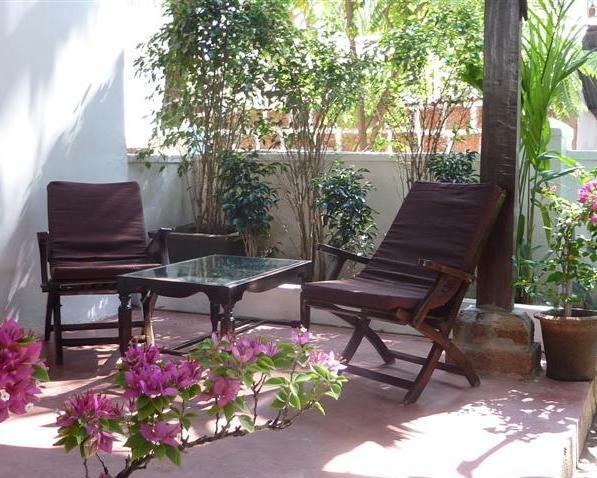 This lovely holiday home is quietly situated in Candolim, North Goa, India. The characteristic Indo-Portuguese restored 100 year old cottage is only 2 minutes walking distance from the magnificent Candolim beach. Casa Lénas has its own privat garden and verandah and can accommodate up to 7 adults/ children. Casa Lénas is a pretty traditional antique filled Portuguese cottage with 3 air-conditioned bedrooms. The rooms have high ceilings constructed in teak wood with terracotta tiles, that maintain the cool environment. Ceiling fans though out the cottage. The garden surrounding the cottage contain a large patio area providing privacy an shade. The bedrooms have king-sized beds, wardrobes and luggage space and the attached bathrooms have rain showers and are stocked with basic toiletries. All bedrooms have airconditioning. We provide you with a fully equipped kitchen for self catering. Dining room with dining table and 6 chairs. We also have an inverter (in case of power cuts), free Wifi and TV. Candolim: Located 14 kms north of Panaji in the state of Goa, one hour from Dabolim airport. Candolim Beach is a part of a long extension of beach coastline along the Arabian Sea that begins at Fort Aguada and ends at Chapora Beach. The main road that is the Candolim Calangute road is packed with shops and restaurants, but the beach front is rather free of any commercial activity apart from some water activities. Though the beach is close to bustling Calangute beach, life is rather laid back at Candolim. Even the village isn't very clustered, its quite spread out so there isn't any centre to it as such. The area around the beach can be termed as resort free as there aren't any resorts there. However, the beach has quite a number of inns at reasonable prices with good facilities.